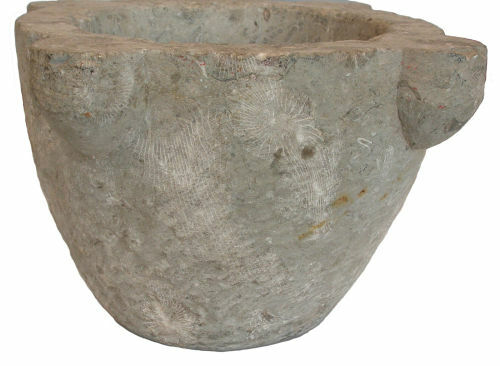 Carved stone mortar of probable later medieval or post medieval date (1400- 1700 AD). The mortar is broadly circular in plan and sub-rectangular in profile. It measures 231mm length, 233mm width, is 141mm high and weighs 5.2 Kilograms (5200 grams). The mortar has been carved from Carboniferous Limestone which is rich in the fossils of Lithostrotion Vorticale and Lithostrotion Junceum. The source of the stone is uncertain, if it extracted from Shropshire then it may be from one of the following areas; Llanymynech, Lilleshall, Little Wenlock or the areas North and South of Titterstone Clee. However, carboniferous limestone is a relatively common rock and is found in many areas of England and Wales, therefore, it cannot be assumed to be a local product. The mortar itself has been carved from a single block of stone. The outer face of the mortar has a large number of small angular dish shaped peck marks present. These are most evident on the lower part of the outer edge. However, the upper edge and the inside are relatively smooth and polished. This polishing may have been due to wear through use, but it may have also been caused by deliberate polishing. 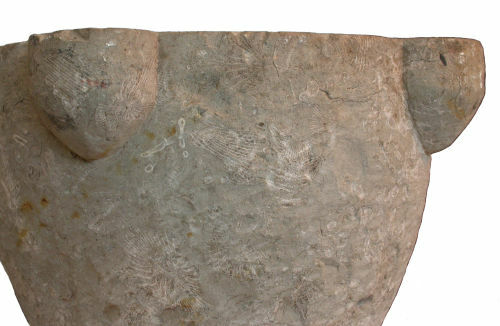 The base of the mortar is also smooth, although not polished to the same extent as the inside faces. Around the upper edge of the mortar are four lobed projections. These are set at broadly 90° to each other. From above these form a relatively simple clover leafed shape. Each of the lobes is broadly D shaped in cross section and sub-rectangular in profile, the lower edge of each lobe tapers to a rounded point. These lobes measure, 44mm length, 46mm width and they project 25mm. The walls of the mortar are of varying thickness, the maximum thickness is 27mm, the minimum 25mm. The inner edge (mouth) of the mortar has a diameter of 136mm. The inner sides taper (slope) forming a conical shaped bowl which has a slightly dished base. The bowl of the mortar is 99mm deep. 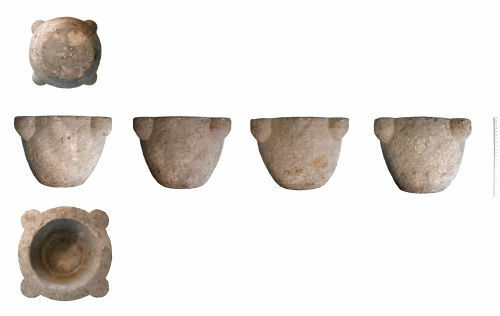 Apart from the outer lobes there is no obvious carved or incised decoration present. However, the abundant fossils within the stone are very decorative and aesthetically pleasing. It is likely that the overall choice of the stone which is fossil rich had as much to with decoration as it did with functional considerations. The mortar is a mid grey colour and it is relatively free from damage. There are a number of places where the stone has been stained orange and this is most likely due to either iron objects (or possibly iron rich water) within the burial environment. A direct published parallel has not been found for this example. Stone mortars are relatively common domestic items which occur on both domestic and ecclesiastical sites in the medieval period. This example was shown to Dr Nigel Baker, who wrote the stone report on the artefacts from Shrewsbury Abbey. He suggested that this example was probably of a later date to the more common ribbed and lobed medieval mortars recorded at the excavations. He also suggested that this example maybe of post-reformation date and might be an apothecaries mortar, although he had not seen a direct parallel for this example. An almost identical stone mortar (with less frequent fossil inclusions) was brought into Ludlow Museum for identification in the late 1990’s. This was identified as a medieval mortar by the archaeological curator, Emma-Kate Lanyon. That example was found near to Craven Arms, Shropshire. Thanks are extended to Daniel Lockett, Phil Cawood, Dr Nigel Baker, and Emma-Kate Lanyon for their help in identifying this artefact and the stone it was made of.